The term paraventricular nucleus of the hypothalamus refers to a prominent narrow cell group in the anterior hypothalamic region of the hypothalamus. Defined classically on the basis of Nissl stain it is bounded rostrally by nuclei of the preoptic area, medially by the preoptic periventricular nucleus, laterally by the preoptic area, anterior hypothalamic area and fornix, ventrally by the dorsomedial nucleus of the hypothalamus and caudally by the dorsal hypothalamic area and/or the dorsomedial nucleus of the hypothalamus. While magnocellular and parvicellular divisions are distinguished in all species, the nucleus is subdivided differently in the human ( Mai-2004 ) and the macaque ( Paxinos-2000 ) compared to the rat ( Swanson-2004 ) and the mouse ( Dong-2004 ), where internal divisions are more distinct ( Saper-2004 ). 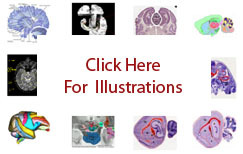 In the rat, the nucleus is divided into a magnocellular division of the paraventricular nucleus, a parvicellular division of the paraventricular nucleus and a descending division of the paraventricular nucleus. Each division is further subdivided into several parts. Functionally the nucleus is part of the subcortical motor system with different parts of the three primary anatomical divisions belonging to the behavior control column, the neuroendocrine motor zone, and the somatic motoneuron pools ( Swanson-2004 ).